I went to a Thai restaurant a few days ago with a bunch of friends. As I watched them wolf down piles of pad Thai, I had a serious case of entree envy. Even though I stuck my usual Tom Kha Gai soup (I was still on my soup cleanse) this was a new Thai spot we were trying and my soup seemed very watered down… It didn’t have the usual creamy coconut and distinct Thai flavors I’m used to getting. I love Thai food, but usually stick to soups in general. That’s because Thai dishes tend to have hundreds of unwanted calories, inflammatory fats, tons of allergens (hello peanuts and wheat) and other processed ingredients that comes with it. 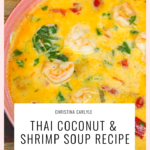 Since I was doing my Soup Detox, I decided to use my superfood soup making method to recreate a healthy Thai Soup instead. It ended up being amazingly delicious. Soooo good! If you love Thai food I think you’re going to LOVE it! 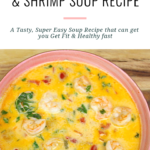 I made this soup again for my family to see what they thought and everyone loved it…. Even my Dad who is a meat and potatoes kind of guy and my sister who hates seafood. 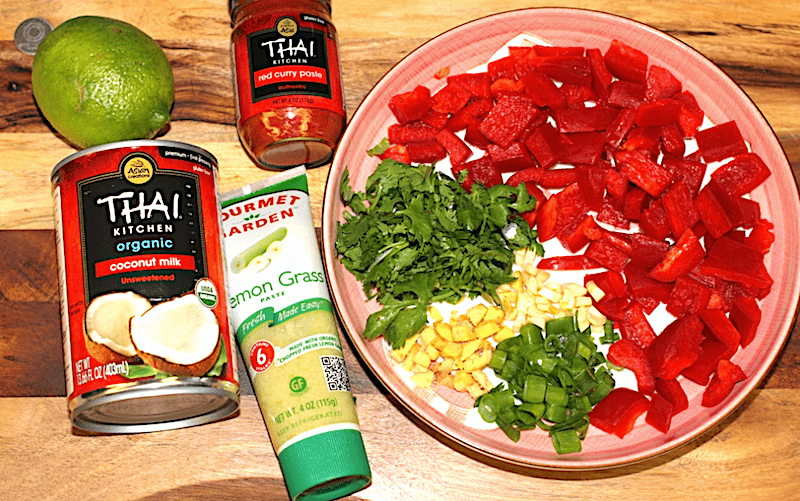 If you’re craving guilt-free Thai inspired comfort food that’s delicious, healthy, light and filling, then this Thai Soup is for you. My version Thai Soup is so satisfying, good and good for you! It tastes a lot like the classic Tom Kha Gai (Chicken-Coconut Soup with Ginger and Lemongrass). But instead of chicken, I used fresh, wild-caught shrimp instead. Most creamy soups are loaded with hidden sugars, calories and saturated fat. But, my recipe is creamy, low glycemic, organic, and dairy free! 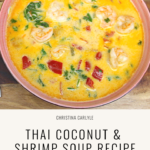 My Thai Soup is a nutritional powerhouse loaded with vitamins, minerals, and antioxidants like Vitamin C, Vitamin K, Vitamin B6, Folate, Potassium, and Manganese. 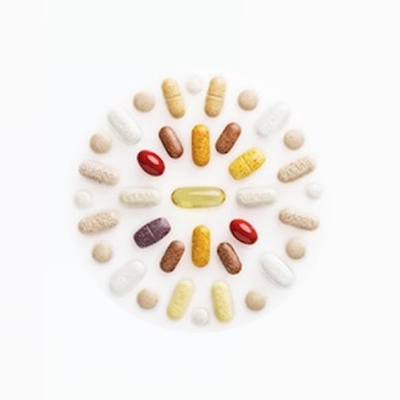 It’s very low in sugar and has brain-healthy plant-based fats, too. Beyond its nutritional praise, it’s pretty dang tasty, if I do say so myself. Take a stroll down the International foods aisle of your grocery store… to grab the goodies you’ll need. NOTE: You can use chicken or beef in place of the shrimp. This is what I used. My veggies are organic. I couldn’t find organic red pepper paste. This was the only lemongrass in my grocery store, too. Wash, dry and prep the produce. In a medium pot, heat 2 tablespoons of oil on medium-high until hot. Add the garlic, ginger, minced lemongrass, scallion, and bell pepper. Cook, stirring frequently, for 1 to 2 minutes, stirring occasionally, 1 to 2 minutes, or until softened. After a few minutes, add the coconut milk, lime zest, and 1 cup of water to the pot. Continue to cook, stirring occasionally, 3 to 4 minutes, or until thoroughly combined. 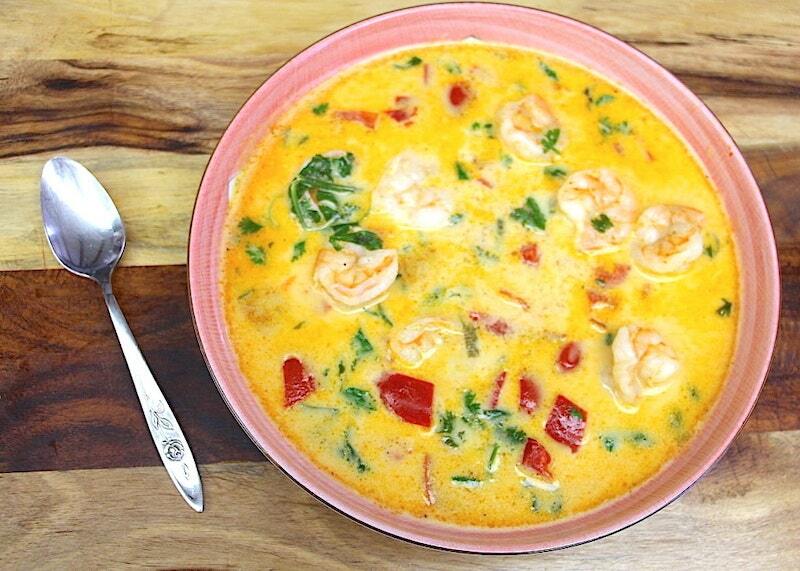 You’re aiming for a slow simmer as boiling the soup, may make the coconut milk separate. 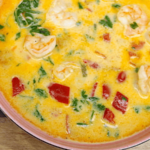 Add the shrimp, cilantro and the juice from your zested lime. Cook until the shrimp are pink and cooked through. Salt and pepper to taste (optional). Garnish with some scallions and the remaining cilantro and lime wedges. Enjoy! FYI This makes 2 servings. 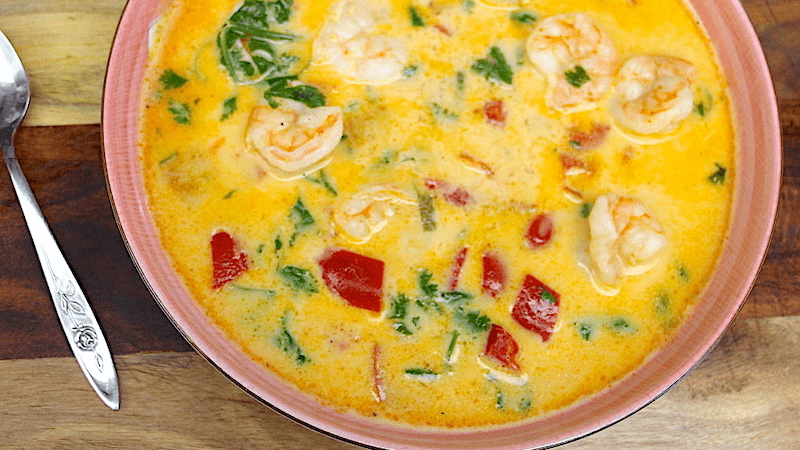 Leave me a comment and let me know how your Thai Soup turns out. 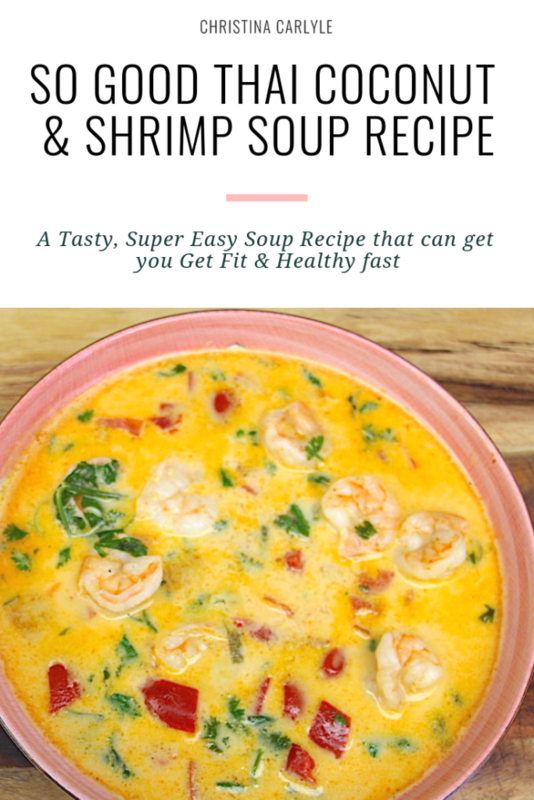 My Coconut Shrimp Thai Soup is a nutritional powerhouse loaded with vitamins, minerals, and antioxidants like Vitamin C, Vitamin K, Vitamin B6, Folate, Potassium, and Manganese. It’s very low in sugar and has brain-healthy plant-based fats, too. Add the garlic, ginger, minced lemongrass, scallion and bell pepper. Thank you sooooo much for introducing me to this soup. It is amazing. I the second time around I tweaked it a bit by swapping out shrimp for chicken and adding mushrooms & peas. Love it. Non farmed shrimp is hard to find. Yay! I’m glad you like it! Shrimp from a sustainable source can be hard to find depending on where you live. Be sure you ask your grocer. How many servings does this and the pumpkin soup make?